How to Cool Down in an Aussie Summer ... or ... Far Out, its so HOT This Week!!! I realise 30C isn't cold, but its alot cooler than 43C. Some parts of Australia reaches over 50C... they're just not usually recorded officially by the news but it happens every January. We lived in a small country town called Laura a few years ago ("few", ok, it was more than a few... it was about 7 years ago). Dad had a thermometer in the shade and another in the sunshine. More than once the shade was over 45C while in the sun it was 57C. Too hot for anything except keeping watch on the animals and for any smoke in the distance. As a child we didn't have an air conditioner, but don't remember it being as hot. But then we were so busy playing with water (buckets, pans, pots, anything), under a sprinkler, in a wading pool, at the swimming pool across the road from my Nanna's (how lucky was that!!!) or going to our local beach. How to stay cool in Summer ... Visit places with lots of water! 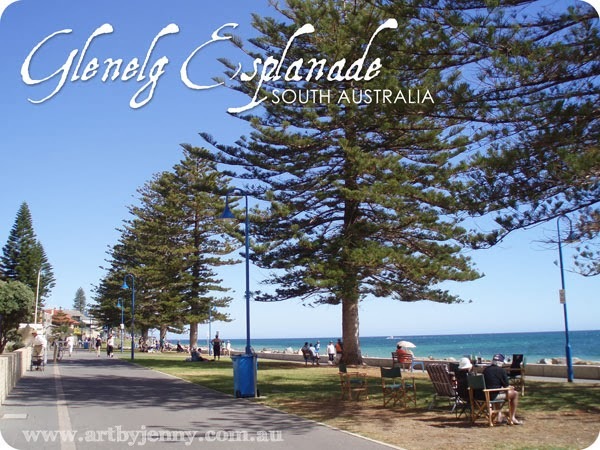 Glenelg is a popular seaside suburb of Adelaide with a beautiful sandy beach with refreshing, cool seawater. 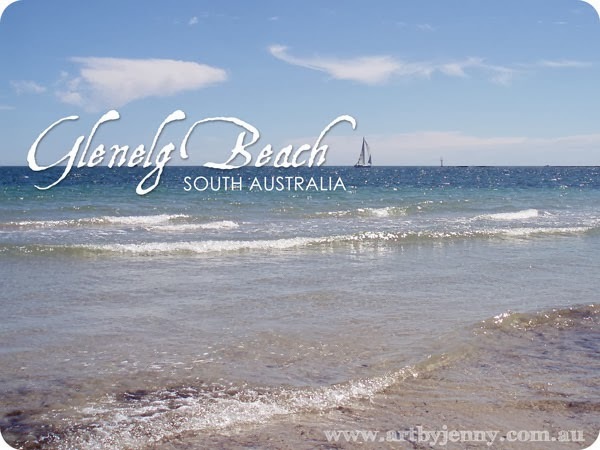 Perfect for swimming, paddling and sailing or simply building sandcastles. When I was little, I'd be found sitting (drawing or colouring in) in front of a fan that had a wet flannel on the back (hanging on the cage of the fan). The air got dragged by the fan through the wet flannel and magically made the air cooler. It blew the pages around but it didn't matter if you were cool. Thank goodness I work from home, so I can go for a swim in the shower whenever I fancy and then get back to work after I've stopped dripping! I think the easiest way to stay cool is to get wet - either with the hose, sprinker, pool, beach, river or just in the bathroom sink. But sometimes (when its not as hot as today) its refreshing simply to visit the many beautiful places we have that have lots of lovely, refreshing, cold, wet water. Whether you go in the water is up to you... sometimes its enough just to visit! This beautiful spot is the Myponga Reservoir, found south of Adelaide on the Fleurieu Peninsula. 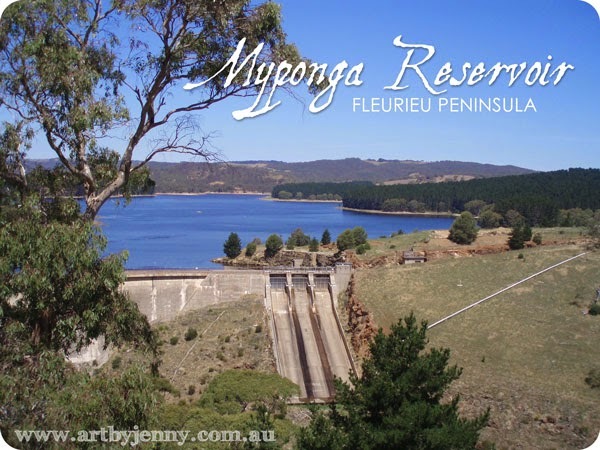 The Fleurieu is a very popular tourist and wine growing region of South Australia. Although we obviously can't swim in a reservoir, its just nice to visit and gaze at all the water ... a lovely cool breeze helps too! 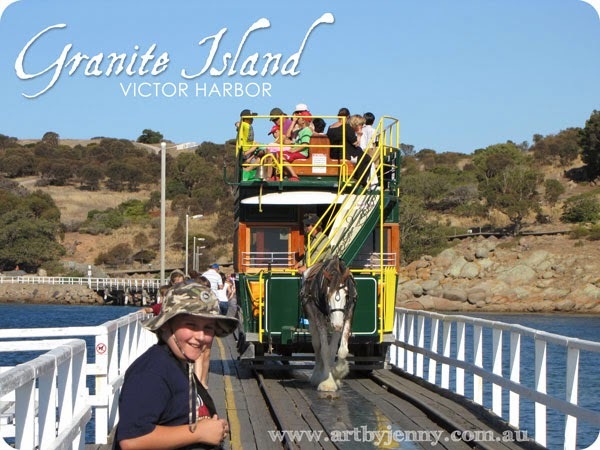 Staying cool on a summer's day is fun when visiting Victor Harbor and Granite Island (pictured), also on the Fleurieu Peninsula. Granite Island is a gorgeous little island with fairy penguins (who are now called Little Penguins and like to hide (as they're obviously sensible) from humans), rocky beaches and a nature walk that shows off amazing views. I feel for all those people in Africa and other places that have similar conditions. I expect those that live on the coastline are a bit like us and flock to the sea when its warm. But I often wonder how those inland stay cool in this heat. Its so dry and hot over there and most of them don't even have a fan, let alone an air conditioner... but I guess you do get used to it. The Tour DownUnder starts on Sunday. For those that don't know, its a week long bicycle race that's part of a world circuit of races. Similar to the Tour de France but in South Australia. Having the Tour DownUnder is fantastic... so many visitors come to our little part of the world and its really busy everywhere for that one week. Locals come out of hiding to watch the race by the side of the road and there are special events everywhere. I hope it cools down a little for them or they'll be racing their bicycles up and down hills on melting bitumen and breathing by boiling hot air while surrounded by a dry, wilting landscape. I'm wishing for a spit or two of rain so at least the dust gets dampened down. But that might be asking too much at this time of year!!! It'll be winter again before we know it and I'm sure to write something about how cold it gets!!! lol Cold here isn't half as cold as it gets in the Antarctica or even like it was in New York last week... that was so very cold. So, wherever you are, I hope you stay cool (or warm!) and have a totally wonderful day. Home / Mixed Media Tutorials - Creating A Life Less Ordinary Through Art / How to Cool Down in an Aussie Summer ... or ... Far Out, its so HOT This Week!! !